Viscose factories may be linked to heavy air and water pollution and damage to marine life, company denies all allegations of pollution. China currently produces over 65% of the world’s viscose fibre; its 21 viscose manufacturers produced 3.511 million tonnes in 2016 and this amount is expected to continue to increase . As is the case with India and Indonesia who are the other two major producers of viscose fibre, the combination of government support, cheap labour and lax regulations is what has pulled viscose production away from Europe and into China . Tangshan Sanyou Group has two viscose plants located in Tangshan city, Xingda Chemical Fibre and Yuanda Chemical Fibre, both of which are subsidiaries of Tangshan Sanyou Group . As many other viscose producers, Tangshan Sanyou is part of the Canopy Style commitment, and international brands buying viscose from these plants include H&M (Sweden), Marks & Spencer (UK) and Tesco (UK) . It shall be noted that in the case of industrial pollution in China, often times it is very difficult for local communities to mobilise or protest. Polluting industries bring economic activity and employment to local towns, so villagers are most of the time highly dependent on the industrial activity. Furthermore, it is not uncommon that companies hire security in order to ensure that journalists and investigators cannot report on any wrongdoings of the factories. Corruption and support from secretive governments is another reason that makes it very difficult for residents to stand up for their rights. In this case there has been some resistance coming from fishermen and also from some individuals posting on social media platforms, however there has not been widescale protests or mobilisations. 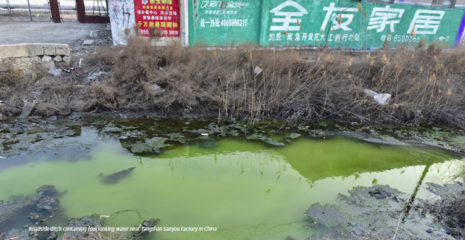 According to a Chinese newspaper, villagers complained about Sanyou discharging alkaline chemical sewage straight into Bohai Bay, causing many fish to die . The company however denied those allegations and released a document stating the accusations were untrue . 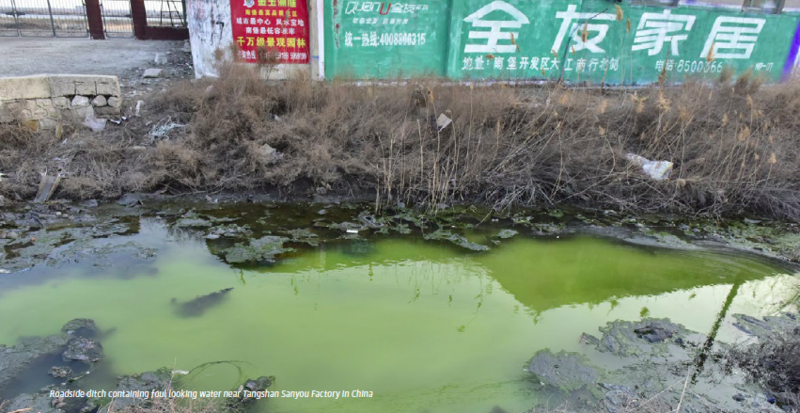 In a town adjacent to the industrial complex where the viscose plants are located, villagers told news reporters that pollution has damaged the nearby river and ponds so much that it has heavily affected their livelihoods of fishing . 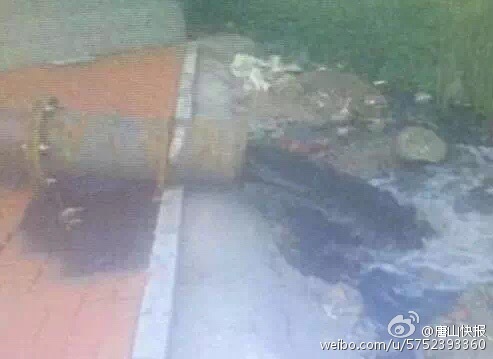 On Weibo, a Chinese social media site, internet users have posted about Sanyou discharging black, foul smelling wastewater straight into rivers at night . In 2015, a city monitoring report revealed that discharge coming from the factories had a very high level of sulphides (higher than the permitted level). 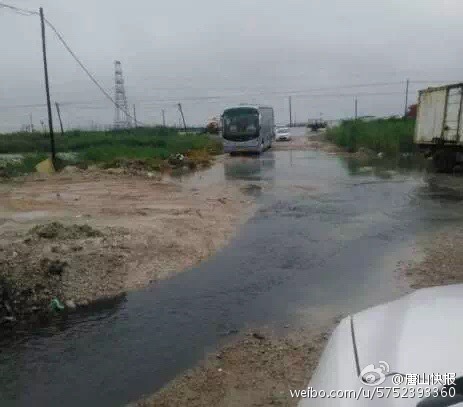 In 2016, local residents complained about air pollution and effluent discharge coming allegedly from Sanyou plants, however the Nanbao Environmental Protection Bureau argued that the company was compliant with environmental regulations . This leave essentially no room for local residents to gain justice when they are told by authorities that the companies are not polluting. The Sanyou Chemical Fibre website has no mention of sustainability efforts or the environment, however each time there has been complaints about pollution they claim they follow all environmental regulations required. Investigators from Changing Markets observed a bad smell around the Sanyou viscose plants, however because there are many other industries operating in the same industrial zone, and they all use a centralised water treatment plant, it is impossible to identify which plant is discharging what toxins at which levels . Project Details The first production line started operating in 1998. The plants produce 500,000 tonnes per year of viscose staple fibre . Tangshan Sanyou Yuanda Fiber Co. Ltd. from China - Sub-company of Tangshan Sanyou Group Xingda Chemical Fibre Co. Ltd.
Why? Explain briefly. The company denies any allegations of environmental wrongdoings. Some fishermen have received small compensations for loss of livelihood but the pollution issue is not being dealt with properly.